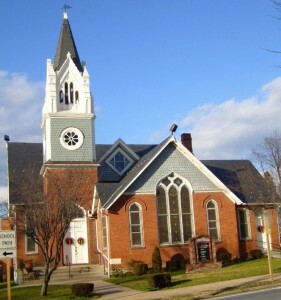 St. Paul United Methodist Church is the third descendant of the first Methodist class meetings held on Sam’s Creek in New Windsor, Maryland in 1760. The congregation that became St. Paul’s began worshiping in a donated building on Main Street. Around 1825, a small chapel was erected with the Rev. J.P. Carter as preacher. In 1841, land was donated to St. Paul’s. By 1843, the sanctuary was completed. As time passed, this building became inadequate and unsafe. In 1897, the congregation dedicated our new building to the continued work of God. In 1962, a church hall and classroom building were added. October 1993 marked the end of the 150th year of our church. During the anniversary celebration, District Superintendent Reverend Bernard Keels and then pastor Reverend Charles Acker opened a cornerstone and placed a time capsule inside for future generations. October 1997 marked the 100th anniversary of our present sanctuary, which in 1998 was used for the filming of part of the popular movie, “Runaway Bride”. St. Paul has been blessed by a long legacy of men and women serving the Lord in the past and in the present. We continue to build a future in the service of our risen Lord and Savior, Jesus Christ.